And truly, although every count of their complaint assumes and depends on the making of false statements, they don’t state any specific statement, false or otherwise, that Wolf ever made about any of them! Not one! Wolf’s focus has been on obtaining official reports and documents under state and federal Freedom of Information acts. So he’s had this motion to dismiss pending in these cases–three nothingburgers in which the claims are identical, by the way, and in two of which the plaintiffs are identical, filed solely for harassment–since July 2018. The court has never decided his motion, instead holding proceedings with the other parties in chambers. The first status conference was completely without notice to Wolf (and there have been others since, where he received the mailed notice the day the conference took place). These proceedings constitute prohibited ex parte communications with the judge. Because of them he filed a motion to recuse (e.g., Doc. 129), detailing several rules of Judicial Conduct which she has violated. This judge, one Barbara Bellis, has not even decided that motion, which by law she is required to decide before taking anything else up. All of Wolf’s motions were (briefly) on the docket to be heard on January 3rd, 2019, but then were mysteriously taken off, without explanation. Judge Bellis has ignored everything he’s filed. The cherry on this sundae of indignities was plopped on last week. In conjunction with his reply on the motion to dismiss (Docs. 118 and 119), Wolf filed a three-inch-thick stack of exhibits, consisting almost exclusively of his FOIA requests and the inadequate responses (actually nonresponses) by the government, to show the court what he has been up to in Connecticut, obviously protected First Amendment activity. In fact, I am the one who did the copying and mailing this time, in case FBT-CV18-6081366-S.
Wolf does not file electronically, so, yes, we are dinosaurs who file things by mail. The copying and mailing job cost $150, and the exhibits were in perfect order in the box, all there, all readable, delivered to the court by UPS by yours truly. However, the clerk of court, when scanning, mixed pages up. Exhibits are missing, they are out of order, the first 20 pages of the most important exhibit are appended to another exhibit halfway through the stack, while p. 21 is the first page in the whole stack, and the like. This is sabotage. I spoke with the chief deputy clerk of court, one Catherine Nielson, and–holding my tongue–offered my assistance to correct the mess, since I know the order the pages are supposed to be in; and she would not speak to me, since I do not “represent” Wolf. But this is a clerical matter, and as a concerned citizen I have the right to inquire into the functioning of the court. Is the box of exhibits even physically still in the court, so that it can be rescanned? She would not tell me. If they threw it out, well, that is abuse of public records, a crime. But when it’s the courts committing crimes, there is no remedy. Wolf asked the court to rectify the situation (Doc. 123); so far this request has been ignored, too. So Wolf’s defense is languishing. He’s the neglected stepchild of the Stepford wives. The other parties are presently fighting about discovery and are even going to the Connecticut Supreme Court. Wolf doesn’t have a dog in that fight until Ma Bellis has determined she has jurisdiction over him, and this she will not do. That is likely because Wolf’s motion to dismiss is a Catch 22 for the bad guys. If it’s granted, they haven’t succeeded in their goal to shut him up via this lawsuit. He’s out of it. If it’s denied, he will immediately begin doing discovery, himself, e.g. : “Produce the birth certificate, report cards, and vaccination records of Emilie Parker.” Of course that is not on their playbill. In the meantime, Wolf’s devoted friend Leonard Pozner (that’s sarcasm, of course), who is suing Sandy Hook skeptics left and right (but, as Anne Berg has pointed out, forgot to sue Pakistan when his “son’s” picture appeared on a wall there as one of several students killed by terrorists), opened his eyes to an interesting abuse. 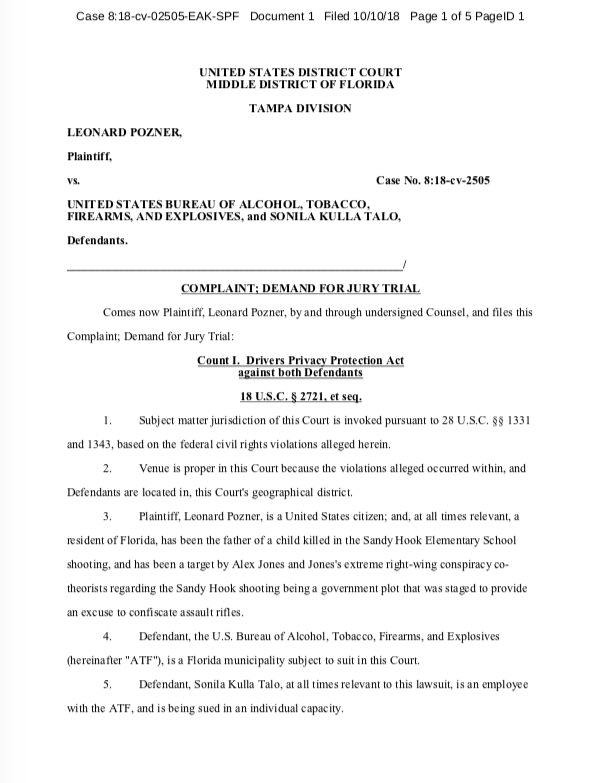 Lenny learned an official with the Bureau of Alcohol, Tobacco, and Firearms had accessed personal information from his driver’s license record, in violation of the federal Driver’s Privacy Protection Act, and has sued that person and the ATF. Taking a cue from this Wolf made a DAVID (Driver And Vehicle Information Database) request, himself, to get information about who has accessed his driver’s license record. The result reveals shocking abuses by law enforcement officials, federal, state, and municipal. I count 13 queries into Wolf’s personal information, by the FBI, U.S. Department of Justice, Lake County Sheriff’s Office, City of Orlando Police Department, Florida Dept. of Law Enforcement, and Orange County Sheriff’s Office. The stated purposes are “criminal investigation” and “verify identity.” They are all illegitimate. Wolf has committed no crime. He is not even under any reasonable suspicion of doing so. He has not even been stopped for a traffic infraction. 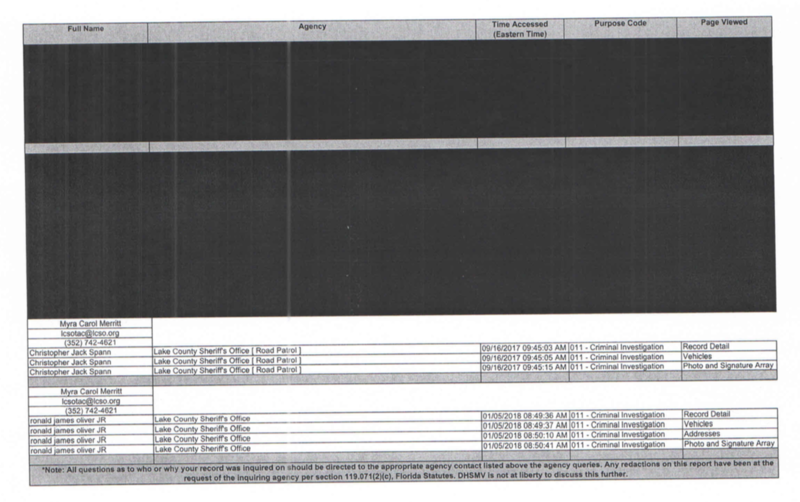 Note the big blacked out portion on p. 3, which means they are not even telling him who made the query, or for what purpose. The law says he has a right to know! Also note p. 4, which was the result of a separate request, whereby Wolf learned that he has been falsely typed as a “mental patient” by the Lake County Sheriff’s Office. This is libel. It remains to be seen what action Wolf will take for these abuses. In the meantime, welcome to the Soviet States of America, where the police are secretly spying on you and following you and characterizing your activity as criminal, when it is constitutionally protected. Alison (Sunny) Maynard obtained her A.B. from Cornell University, College of Arts and Sciences, and her J.D. from the University of Denver College of Law. She was admitted to the Colorado Bar in 1987. Maynard’s blog is The Real Colorado. Sandy Hook Parent Lenny Pozner: A Deep State Cyberpuppet? 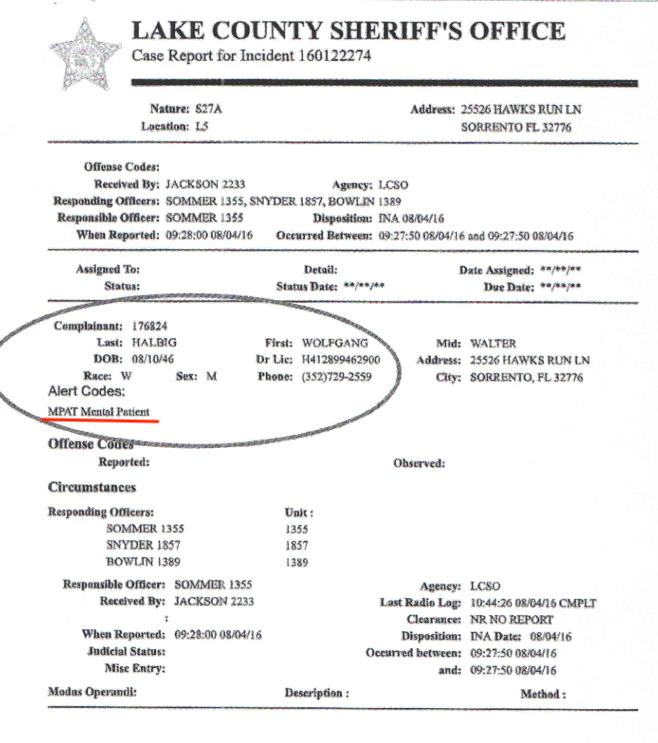 Why is the Sebring shooter being named ” Zephen” Xaver? There is no on eby that name according to intelius or ussearch. His name is Zack Xaver, and all the media covering this failed to find his old Facebook page? The page is interesting itself as he appears to be flashing a gang sign. Perhaps he snapped as a result of gang stalking or is it another false flag? The Honorable Barbara N. Bellis graduated from Boston College with a Bachelor of Arts degree in Classics and Economics and from Catholic University School of Law with a Juris Doctor degree. She was admitted to the Connecticut Bar and the United States DisLrict Courl. Judge Bellis became a judge of the Superior Court on June 3, 2003. Prior to her appointment to the bench, she was a partner with Mulvey, Oliver and Gould where she was a trial attorney specializing in civil litigation primarily for insurance defense, representing individuals, small businesses, corporations, schools and towns. Judge Bellis is presently the Assistant Administrative Judge, the Civil Presiding Judge and theE-Filing Judge for the Fairfield Judicial District, where she also presides over the asbestos docket. She is responsible for the training of new judges in the area of domestic violence as well as providing e-filing training. Judge Bellis is currently a member of the Superior Court Executive Committee; the Judges Advisory Committee onE-Filing; and the Civil Commission; and has served on the Superior Court Rules Committee, the Public Service and Trust Commission’s Courthouse Security Committee; and the Public Service and Trust Commission’s Jury Committee, serving as co-chair of its Voir Dire Subcommittee. In addition, Judge Bellis frequently serves as a mediator for cases pending throughout the state and is an active member of the Judicial Branch Speakers Bureau. Some very serious charges have been made in the article posted above by Professor James Tracy, Ph.D. by lawyer Allison Maynard J.D. of the State of Colorado, documenting gross misconduct by “Honorable” Superior Court Judge Bellis above and members of the office she supervises in Connecticut, regarding the simple claims of a U.S. Citizen Wolfgang Halbig to obtain simple public information. I think Judge Bellis, J.D., graduate of both Boston College and Catholic University, has a duty to answer the above criticisms. If she fails to do this satisfactorily, in a reasonable amount of time, say one month, I think she has a duty to the citizens in Connecticut and the United States to resign, and I believe most other U.S. Citizens would agree with this recommendation. Perhaps it has been so long since she graduated from law school she forgot the words in the U.S. Constitution which she took an oath to protect and defend and which have been defended by the blood of thousands of members of our military for over two centuries. If the above behavior described is true, I say shame on you Judge Bellis. Winfield J. Abbe, Ph.D., Physics, UC Riverside, 1966, M.S., Physics, California State University at Los Angeles, 1962, A.B., Physics, UC Berkeley, 1961, born Cleveland, Ohio, 1939, United States Citizen in good standing for nearly 80 years. Thank you Allison Maynard, J.D., for having the guts and courage to stand up for the basic Constitutional rights of another United States Citizen Wolfgang Halbig of the State of Florida. It is a judicial obscenity that he has been so mistreated by so called “officers of the court”. Thanks also to Professor James Tracy , Ph.D. for having the courage to post this betrayal of the public trust by officers of the public courts in the State of Connecticut. This behavior by an officer of the court against a United States Citizen of Florida is a shameful disgrace to every good service man or woman who placed their lives on the line for our precious Constitution. Shame, shame, shame….on you. Thank you very much, Dr. Abbe. Did you know that the firm Koskoff, Koskoff & Bieder, which hosted that presentation by Judge Bellis, represents the plaintiffs in this case against Wolf? Wolfgang Halbig is a very intelligent and concerned citizen who cares about events around him and claims about those events by talking mouths on media. He has the questioning spirit which is ostensibly the goal of all college educations. Every good citizen should have the questioning spirit in all things; but most do not or remain silent for many reasons. There were videos of Wolfgang Halbig and his lawyer sitting in on meetings with the Newtown School Board and their lawyer regarding the release of what would normally be simple public information which could and should have been automatically voluntarily published by this school board much earlier for any citizen to read. Each request by Mr. Halbig and his lawyer was dissected and critically analyzed by the school board lawyer as if it was some sort of confidential national security secret which must be protected at all costs by the full military armed force of the government of Connecticut. Why? Why all the secrecy regarding the operations of a public body paid for with public tax money extracted from the public by laws which require stiff penalties against the taxpayers for failure to pay taxes, but no penalties against school boards or their members or their lawyers for obstructing the release of their public use of this tax money. Why all the secrecy? Why all the hypocrisy? Is this Nazi, Germany or the United States of America? It was and is obvious that by going to all this trouble and causing all this trouble and expense for Mr. Halbig to obtain this information, the school board and their lawyer were deliberately and with malice, stonewalling and clearly seeking to hide public information from the public and cause him great harm he paid to elicit the TRUTH. The only explanation for this unconscionable and illegal conduct is that they were hiding, using the illegal force and cover of law, unethical and or illegal actions of the school board in secret, behind closed doors. They are abusing their powers by forcing Wolfgang and his lawyer to spend thousands or hundreds of thousands of dollars and time to get information, never even released anyway, which should have been automatically published in the first place by them! This is disgraceful and against all the intentions of open records and open and honest government laws. By the way have you observed there is no shortage of penalties against ordinary citizens and taxpayers when they violate the myriad of laws and rules and regulations for them every day, but no, zero, penalties for criminals on the Newtown School Board and their lying lawyer who obstructed Wolfgang and his lawyer for the simple release of public information, illegally held secret, in blatant violation of open records laws! This is a perfect example of the meaning of hypocrisy above. Of course we all, or at least some of us now, know why the criminals on the school board were violating the open records laws, and refusing to provide public information to a United States Citizen: Because they were criminally covering up the crime of the Sandy Hook School Shooting hoax, that is why. This is all like an Agatha Christy Novel of intrigue where virtually an entire State has pulled off a massive con on every citizen of the United States and world, while using the ruse of secrecy to hide their criminal activities and lie to the public about it all. What a shameful disgrace. And then to rub a little salt into the wounds, some unethical lying lawyers are suing and abusing the legal process, against Wolfgang when they very likely are fully aware of this massive con perpetrated on all America! This is why so many lawyers and the “oldest” profession of law, going back centuries in time, get their well deserved bad name. Secrecy is the enemy of the truth. If we had secrecy laws preventing the laws of physics and mathematics being discovered and disseminated by any and all people, we would still be back in the dark ages. And the dark ages is where we are in the phony fake and swindle and scam and con… of the Sandy Hook Hoax Shooting December 14, 2012, where a number of unindicted criminals have become rich from this massive scam six years and counting. Please, Alison Maynard, J.D., correct any errors or incorrect statements or conclusions in this comment. Thank you and again everyone should have very high respect for Alison Maynard, J.D., one of the handful of honest and courageous and intelligent lawyers of the 1.3 million who are mostly deafeningly silent about the massive Sandy Hook Hoax on America. Remember, I am just a lowly physicist who has sat through over 300 semester hours of classes over a period of ten years in four public colleges and universities in California but what do I know about the oldest profession called “law”? I thought the oldest profession was the “other” one. Did you know that even the mythical society of Utopia by Sir Thomas Moore in England banned lawyers because they “disguise” matters? Disguise is a polite word for lie. This was in the year 1516! Winfield J. Abbe, Ph.D., Physics, UC Riverside, 1966. Former faculty member with lifetime tenure, University of Georgia, Athens, Georgia, 1966-1978; voluntarily resigned mainly due to lying and cheating by two deans and three department heads to the tenured faculty for over 5 years. In other words, even deans of a College of Arts and Sciences from English to Microbiology or professors of physics tell lies too, not just some lying lawyers and judges or school boards. In fact even the president of FAU and his crony administrators lied to relieve perhaps their top and most courageous professor James Tracy, Ph.D. of his tenured job all because they did not want to hear the intelligent disclosures and truths he had to say to them! Shame, shame, shame….on all of these worthless brainwashed unquestioning cowards called U.S. citizens today. I am with you on all of it, Winfield. I, too, have been the victim of the lying lawyers (as well as their clients). I agree with your assessment of the hypocrisy. As an evidentiary matter, as well, when public officials do not produce reports or other documents they are required, by law, to create, it constitutes an admission that the documents were NOT created, and thus that the law was violated–and the event did not take place in the manner their mouthpieces maintain it did. As an admission it is usable in court. Everyone who reads through Wolf’s FOIA requests, and the official nonresponses, can see immediately this event was staged. Being a resident of the Nutmeg state, having followed the rotting hulk called Sandy Hook, having watched in amazement and disgust the FOIA court proceedings with Wolf Halbig, I’m only too aware that perps representing SH and other false flags are protected by an agency that has been willing to spend unlimited money to defend their spurious protections subtending SH. Nothing surprises me regarding this latest action directed against Halbig. When da judge comes into the back of the courtroom, the attending sheriff bellows “this kangaroo court is now in session”. 97 percent of federal court adjudications end in a simpering plea bargain when the judge helps the defendant cop a plea. “Either accept this short sentence and admit to guilt or have the book thrown at you”. This is how the new American court system works. America is now lawless and Wolf has seen this up close. This is a very perceptive comment. Why is Connecticut Called the “Nutmeg State”? “Technically, it’s not. Connecticut’s “official nickname”—there is such a thing—is the “Constitution State” because of historian John Fiske’s claim that the Fundamental Orders of 1638/1639 were the first written constitution in history. But now to the issue at hand, the spiced sobriquet: Connecticut’s most popularly used unofficial nickname is that of the Nutmeg State. During the 18th and 19th centuries, several associations between the state and the spice emerged. Early sailors would bring the valuable seed back on their foreign voyages. Over time, Yankee peddlers developed a reputation for selling fake nutmegs made of carved wood. Later, it was suggested that it was the confused Southerners to blame for these mix-ups. In a 1980 issue of Connecticut Magazine, Elizabeth Abbe suggested that Southern customers were unaware that nutmeg had to be grated, and instead wrongly thought that the Yankee merchants were trying to scam them. In other words people of Connecticut have been fooling others in the States below them for a long time. Could it be that the town of “Slickville” has morphed into Newtown today and the nutmeg con has morphed into a massive hoax on all Americans by Sandy Hook School and nearly all officials of this “Nutmeg” State? After all it took a lot of liars and a lot of lying to fool so many about this massive con on America. But this serious lie has no humor in it at all. I was trying to refresh my memory as to what are the specific legal charges against Mr. Halbig in this case. I know it is a civil case but I cannot see what the specific charge is. Defamation? Libel? I know if I search around long enough I will find that information but I have come to the conclusion that this no longer about obtaining just proceedings leading to a speedy resolution of this case. However this article is very good in showing us what an insult and joke the Connecticut legal system is. 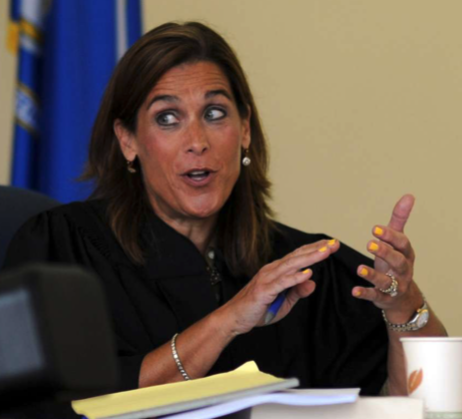 The photograph of this judge with yellow nail polish says it all. At this point, Mr. Halbig’s case reminds me of the activities of Judicial Watch organization which spends all of its activities in obtaining records and filing FOIA requests and filing law suits to obtain records. This organization’s efforts, although often quite successful and providing excellent online drama and entertainment value, stop there. Judicial Watch hands over its found records to congress and congress is never able to carry forward to legal action because they must submit their findings to the Department of Justice and they never seem to do that, but even if they did, the DOJ is just as ineffectual as is the U S congress in pursuing and obtaining justice. I will ask again, as I have three or four times here, is this objective editing and good journalism using the term “Sandy Hook MASSACRE event”? I do not even like the term “Sandy Hook School SHOOTING event” but that seems closer to objectivity than massacre. Good points especially concerning Judicial Watch’s efforts. The problem in fact lies with the relevant agencies’ willingness to investigate themselves and/or their cronies. Feedback re “Sandy Hook Massacre Event” noted as well. I feel the same way, Dachsielady, and always refer to it as the “Sandy Hook event,” or with quotation marks. Hadn’t even noticed the yellow nail polish–that is downright ghoulish, haha. As for the charges against Wolf, I was not kidding when I said they do not state a claim. The Lafferty case has 394 paragraphs over 39 pages. It states five claims for relief, each of which depends on the making of a false statement about the plaintiffs–each of the plaintiffs–yet they did not identify any such statements made by Wolf (the reason for saying the plaintiffs have no standing so the court does not have subject matter jurisdiction). The claims are (1) false light invasion of privacy; (2) defamation and defamation per se; (3) intentional infliction of emotional distress; (4) negligent infliction of emotional distress; and (5) Connecticut Unfair Trade Practices Act, Conn. Gen. Stat. Sec. 42-110a et seq. Wolf will file a motion about the failure to state a claim if his present motion is denied. In the meantime, today the plaintiffs gave notice that they have served interrogatories and requests for production on Wolf. He has no duty to respond, since the court has not ruled on his motion to dismiss. I am concerned, however, that an order imposing sanctions will nevertheless issue from the court, which looks valid on its face but is, in fact, a sham, since the court has never determined it has jurisdiction over him. Yes, nothing but perfidy in this Temple of Ghouls known as the Connecticut Superior Court. Finally, Judicial Watch is a 501(c)(3), prohibited from engaging in lobbying activities. That may be the reason they feel they can’t do more than provide info to Congress. Thank you, Alison, for your courage and diligence. Wolfgang Halbig is fortunate indeed to have you fighting for him. Although it isn’t the same type of case, it has the same reek of corruption, wasted time and avarice as the fictional Jarndyce vs. Jarndyce in Charles Dickens’s “Bleak House.” In the novel, a “Mr. Krook” spontaneously combusts. If only the false charges in this case would similarly go up in smoke. There will soon come a time in America when the only resolution the citizenry have left is to enact their god-given second amendment rights. The very reason the second amendment was written. The enactment of this right will be swift, and certain – as the citizenry reclaim ownership of the United States Constitution, and the very reason for its existence. It should be noted that Barbara Bellis was nominated to the Superior Court bench in 2003 by then governor John Rowland. Rowland leaves his own trail of stale and dirty bread crumbs in Connecticut. He is a twice convicted and imprisoned career politician last released from jail in 2018. Former governor Rowland on one occasion labeled then governor Malloy a pathological liar, but later apologized. The pot calling the kettle black. Geez, what does THAT tell ya? Quote from Roger Stone in interview of January 25, 2019 by Tucker Carlson of Fox News. I think there is record that Wolfgang Halbig is being subjected to this same game. When I first read about this earlier “victory” of Wolfgang Halbig in his courageous legal case and fight of 2017, I took it at face value and that there are some honest judges and some fair legal proceedings and trials still happening and that this was indeed a victory and hopeful sign for Mr. Halbig. But now I see how the judges and courts operate. The judge in this thread topic current case of Mr. Halbig, may just operate according some perfunctory secret protocol where the judge at the last minute will order “Pozner” to appear in person and on video and the case will be dropped by the plaintiffs. That is the game and the secret way this may work. Mr. Halbig and all the patriots who are helping him are again left holding the bag, as may happen to Roger Stone in his current battle. I do not wish to be Dachsie Downer here but I think we need to see the patterns and the reality as so very much is at stake for our republic. “Lenoard Pozner, who claims to be the father of one of the children alleged to have died during the mass murder of 20 kids and 6 adults at Sandy Hook Elementary School on 14 December 2012, filed a lawsuit against me, Mike Palecek and the company on 27 November 2018 for defamation by denying that his son, “Noah”, had died at Sandy Hook, and I was served on 29 November 2018 at my home. It was therefore unsurprising when I received a call from an AP reporter, Pat Eaton-Ross, who hangs his hat with The Hartford Courant in Connecticut, on 4 December 2018 about the suit. His call was dropped almost immediately, so I called him back. I reviewed basic facts about the book at the core of the case, NOBODY DIED AT SANDY HOOK (2015), which includes contributions from thirteen experts, including six (current or retired) Ph.D. professors, which amazon.com had promptly banned. I explained to him that we had discovered that the school had been closed since 2008, that there were no students there, and that it had been a 2-day FEMA drill presented to the public as a mass murder. We even discovered the FEMA manual for the exercise, which we included in the book as Appendix A, where anyone can download the book for free as a pdf by entering its title in their browser and verify what we found for themselves. He even told me, “I’ve read all your stuff on-line”. Imagine my surprise, therefore, when the story appeared and he declared that Mike Palecek and I were the AUTHORS rather than the EDITORS of the book, which was a gross falsification of the facts of the matter, which I had even summarized for him immediately before he published the story–which, as an AP syndicated article, has been published worldwide, including in the Wisconsin State Journal. So I have dutifully written to the paper, which is by far the largest in Wisconsin, where I reside, explaining that this appears to have been done because, once you know there were thirteen contributors, including six Ph.D.s, the likelihood that we would be wrong in our conclusions becomes exceedingly remote–not impossible, of course, but with a probability approaching zero as its limit. HARTFORD, Conn. (AP) —“ The father of a boy who was killed in the 2012 shooting at the Sandy Hook Elementary School in Connecticut has filed another defamation lawsuit against conspiracy theorists who accused him of being an actor. First, observe in the quote above that Robb incorrectly states that Professor Jim Fetzer and Mike Palacek “co wrote” a book “Nobody Died at Sandy Hook”. Yet he had been told they were the editors while it had about 13 authors. Professor Fetzer even recorded their conversation. Therefore this was evidently a deliberate falsification and misrepresentation in this AP article, not some “innocent” mistake. I refer the reader back to Professor Fetzer’s original article for his comments on this. The second point is the mention of the word “conspiracy” and the phrase “conspiracy theories” in the title and text respectively quoted above. These references have been used, by ignorant writers like Pat Eaton Robb above and many others, to disparage legitimate scientific research findings with the goal of reaching the truth of an unsolved question or problem in virtually any subject. For example every scientific investigator from physics to chemistry to mathematics to engineering, …wears the badge of “Conspiracy Theorist” as a badge of honor. Whenever one is facing an unsolved problem in physics or chemistry or engineering, etc., one poses mental images of what might be happening. Anywhere from one to any number of different scenarios might be posed. Then these are carefully dissected and analyzed and confronted with all the experimental and theoretical facts brought to bear on the problem. After often long and arduous thought and consideration, which involves many aspects like researching any and all other proposals of others in the past and present on the same subject, talking to experts in the field, confronting the facts with intelligent contradictions and the scientific method, etc., one may then finally arrive at a conclusion as to the correct theory which fits with experimental facts and data and hopefully arrive at the TRUTH. However whatever is then claimed to be truth is always, from that instant forward, still tentative and can and will be thrown out and replaced by a better theory if the experiments and facts so demand. So the ignorant reporter above obviously never took many physics or mathematics or true science courses since he obviously does not know how real scientific research is conducted since he seeks to disparage those who propose theories of events with the disparaging adjective “conspiracy” In fact the real conspiracy here is not what Professor Fetzer and his associates propose for the facts surrounding the alleged Sandy Hook Shooting, but the false unsubstantiated claims of the many lying media articles and the lying authorities who have sought to cover up the true evidence and facts of what actually happened at Sandy Hook School in Newtown Connecticut, December 14, 2012. They are the phony Conspiracy Theorists who seek to fool and deceive the gullible and ignorant public like the AP writer Pat Eaton-Robb above, not Professor James Fetzer, Ph.D. or Wolfgang Halbig or Professor James Tracy, Ph.D.
shows the type of critical thinking which is necessary to reach the truth of any unsolved problem in science. There are roughly 1.3 million lawyers in America. There are roughly 50,000 professional physicists in the American Physical Society, mostly who have attained a Ph.D. degree, which usually means at least ten years of study in a field, yet most if not all of the top legal experts, except Alison above and some others and physics experts have remained deafeningly silent on the alleged Sandy Hook Hoax. Professor James Fetzer, Ph.D., a top scholar and intellect and true scientist from Pasadena, California about 1940, and a former officer in the U.S. Marine Corps, may be a better scientific observer than most Ph.D. physicists, he may be a better mathematician than most Ph.D. mathematicians, he may be a better true scientist than most scientists and a better journalist than most journalists because he has the amazing guts and courage and intelligence to go up against a monstrosity of obstruction and lies from the “profession” of journalism to nearly every agency in the totally corrupt cesspool State called Connecticut which has been improperly called the “Constitution” State, but now must be dethroned of that undeserved title since they have gang raped it in so many illegal and criminal ways. Professor James Fetzer, Ph.D. and associates and Wolfgang Halbig, and associates, and Professor James Tracy are national heroes, not the villains the media liars like Pat Eaton-Robb and his ignorant unquestioning employer the Hartford Courant and many others would have us believe. It is these liars who are the ignorant ones, not Professor James Fetzer, Ph.D. or Wolfgang Halbig or Professor James Tracy, Ph.D., and their associates, who all deserve the Medal of Freedom for their courageous efforts, following the rules of logic and science, to reach the TRUTH of the massive Sandy Hook School shooting hoax or scam or con or swindle or sting…; on all good United States Citizens. Shame, shame, shame… on all those responsible for perpetuating this massive conspiracy lie on America to fool and deprive all Americans of their fundamental right to own and possess guns for self defense as provided in our precious Constitution Amendment Number 2. All this and more are why every college student should fill up all the physics and mathematics courses and avoid all the other mostly worthless garbage which do little to enhance brain development and brain function in our population. The only way to learn how to think is to do a lot of thinking for oneself, not allowing other liars in the media to do your thinking for you. I recently learned that both male and female students in China have as a common ground of learning, engineering knowledge,so the Chinese probably agree with you about the suitability of that kind of learning for developing clear thinking. How far are they willing to push this fake shooting? Looks like they are going all in. I got a small taste of being the nail that sticks up too far and gets hammered back into place. I finally got the Vail Daily to do a story on the synthetic clouds created by jets. I provided crystal clear photos of the spray coming out of the entire body of the aircraft. They did not use one. Instead they photoshopped a picture of me looking up to the sky with no planes. What a hatchet job… the implication being I’m hallucinating… forget about the fake clouds, there’s not even aircraft up there. I was furious. But then something unexpected happened. The comments section exploded. They saw the story for what it was and corrected the distortions. The Newspaper shut down the comments section and made it disappear for years after that. Not just that story, all stories!! They only recently reopened the on-line comments section to their stories. Good description of how the media has been a bad joke for a very long time. I’ve had hope he would expose 9/11 and these other false flags. But we will end up the same as when we hoped that Bill Clinton — Bill Clinton! that’s a long time ago — would free Leonard Peltier. Peltier is still in prison. Penn Magazine is named in honor of Penn Jones, Jr., one of the first researchers into the John F. Kennedy murder, an honest newsman, who did not lie to us. I do not know if this is the best place to post this information but I can identify no place where all Sandy Hook discussion takes place. SUBJECT: Wolfgang Halbig’s WH recent important work regarding the identify of the “fourth graders” at the time of Sandy Hook, December 2012, approximate age 10. WH stated at 1:43 to 2:45 on this video that he is “in communication” regarding these now just graduated from high school “fourth graders” who are having misgivings about their being exploited to play act in the SH movie and are concerned about their lives and their futures from that experience. If these girls, it seems mostly girls we are talking about here, come forward with how they were recruited and used to partipate in the SH deception, it could blow the lid off of all SH-related lawsuits. I observe that “Noah Pozner” is a completely separate “person” inserted in the SH deception, separate from these “fourth graders”.” But these girls’ possible official truth telling in the near future would also destroy all “Noah Pozner” lies. Here is a separate photo I picked up from another forum I used to participate in. Dead sh girls get together for a reunion? I do not anything about the original source of this photo but there is some important information to be gleaned therefrom and appears to relate to WH’s current work. I think that if there are real people out and about today who were used as the subject victim children of the SH movie, their lives are really quite in jeopardy and they may be captives of the USA shadow government and they are not now able to walk freely in their lives in the USA from now on, nor will they ever be able to do so. If they are real people, they are owned. I find it rather despicable that parents of fourth graders would allow their children to lie on such a grand scale to the American public so that their children’s remaining lives will forever be ruined and scarred. To my knowledge, no one ever has seen these grown up child actors since the event. That is as it was also with 9-11 also with crisis actors and they were never seen or heard from ever again by anyone, other than in MSM print articles. Most children had survivable wounds. They died 18 minutes from an excellent medical facility because they were not transported to it. They were not transported to it because in the first hour of the response, a total of two ambulances were available for 29 gunshot victims. That is because for a solid half hour, the dispatcher was told there were only two victims. By the time he heard third-hand that there were dozens of wounded, it would be a full hour before the additional ambulances reached the scene. The injured/deceased ratio among the children (0/20) was never believable. Halbig is a PR firm contractee for the State of Connecticut (that’s why he always points the finger at Newtown officers). The state and Newtown are in heated battle over who bears the most liability for the unnecessary deaths. The alleged “heated battle” is another fake story post event to cover up the cover-up. They want the people to bite the bait that there is this alleged battle because to do so means acceptance and understood as true injured and deceased real victims. How many times have we seen the same plot inserted after so many other false events?